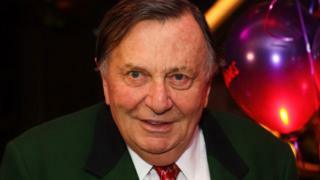 One of the world’s top comedy festivals will no longer use comedian Barry Humphries’ name for its chief prize, after he was accused of transphobia. The Melbourne International Comedy Festival said its prestigious Barry Award for best show would be renamed. Humphries, best known for his character Dame Edna Everage, has repeatedly drawn anger for his comments on transgender people – and later defended himself. His remarks had “definitely played a part” in the change, the festival said. Last year, he drew criticism for describing being transgender as “a fashion”. In another controversy, he claimed to have been speaking in character when he referred to gender-reassignment surgery as “self-mutilation” in a 2016 interview with The Telegraph. He also described Caitlyn Jenner as a “publicity-seeking rat-bag”. He has previously said his comments were misinterpreted, but they have been criticised by other high-profile comedians – including former Barry Award winner Hannah Gadsby. Humphries co-founded the Melbourne International Comedy Festival in 1987, and it is now one of the world’s premier comedy events. Its top prize has been named in his honour since 2000. She told the Australian Broadcasting Corporation that Humphries’ recent comments were “not helpful” and had helped instigate the decision. Gadsby criticised Humphries when she accepted the award in 2017 for her show Nanette, now a worldwide success on Netflix. “I don’t agree with a lot of the things Barry Humphries has said recently,” she said at the time. Previous winners of the award include Ross Noble, The Mighty Boosh, Demetri Martin and Nina Conti.